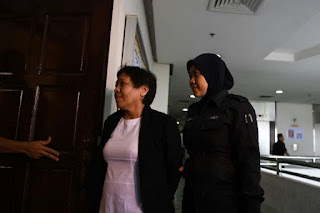 An Australian grandmother who faces a possible death sentence in Malaysia for drug trafficking testified Tuesday that she was a victim of an online love scam. Maria Elvira Pinto Exposto, 54, was arrested on December 7, 2014 at Kuala Lumpur airport with 1.5 kilograms (3.3 pounds) of methamphetamine. Customs officers discovered the drugs stitched into the compartment of a backpack she was carrying. Malaysia has a mandatory death penalty, carried out by hanging, for anyone found guilty of carrying more than 50 grams (1.75 ounces) of an illegal drug. Exposto told the High Court she fell for the online romance scam masterminded by a certain "Captain Daniel Smith", who had identified himself as a US soldier based in Afghanistan. Defence lawyers said that she was lured into carrying a bag -— which she believed contained only clothing -- by "Smith" who asked her to take it to Melbourne from Shanghai. She was in transit at Kuala Lumpur airport when she was arrested. "He (Smith) made me feel loved, he made me feel wanted," Exposto told the court, adding that the alleged US serviceman would send her photos of himself. "Smith would sing to me a few times a day and send love poems as well," she added. Exposto said Smith had also asked to marry her in September 2013 at a time when her relationship with her husband was getting "a bit sour". Defence lawyer Muhammad Shafee Abdullah told reporters that Exposto's testimony suggests her close online relationship with Smith. "There are probably thousands, mostly women, who have been conned into similar situations. Captain Daniel Smith is one of the many scammers," he said. The trial will continue until Friday. Two Australians were hanged in Malaysia in 1986 for heroin trafficking -- the first Westerners to be executed in the country.